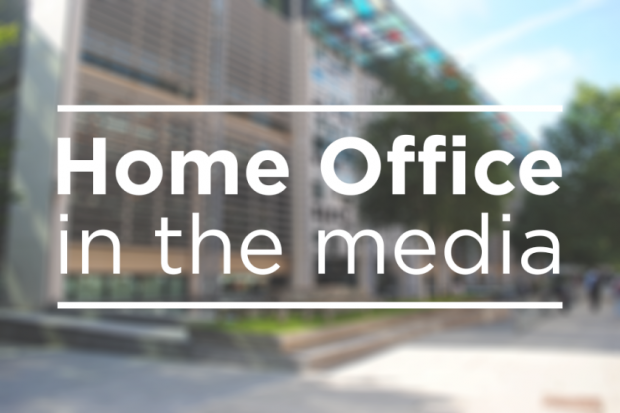 Today's Home Office coverage includes our announcement of a consultation on the use of body-worn video cameras by police. The Times, Independent, Mail, Sun and Star report that police may soon be allowed to interview suspects at crime scenes using body-worn video cameras. The proposal will mean officers could for the first time question suspects away from a police station. The papers say officers can already use evidence captured on the cameras, but the plans would allow them to record testimonies with them as well. The Mail reports that Ministers say that enabling officers to have a visual recording instead of a handwritten note would save time and money while strengthening protection for suspects. All coverage reports that by the end of the year, 60,000 body-worn cameras will have been deployed across England and Wales. The Mail notes that the plans have prompted concerns from the Criminal Bar Association who believe that the use of the technology could undermine the basic rights of suspects. A statement from the Policing Minister is below, and further information on the consultation is available in our press release on the Home Office website. Having met officers across England and Wales, I’ve seen how technology is bringing 21st century solutions to age-old policing problems. I want our police officers to have access to the best possible equipment, and to be able to use it to bring greater efficiency to frontline policing. We will keep looking for ways to save time and work more effectively, and we will do everything we can to support forces as they adapt for the future.